Citizen scientists take note: You can help save the planet from threatening space rocks, and win some prize money to boot. NASA and asteroid-mining company Planetary Resources have teamed up to launch a contest series called "Asteroid Data Hunter," which asks the public to develop algorithms that can help identify space rocks in Earth's neck of the cosmic woods. The contest series, which is managed by the NASA Tournament Lab, kicks off March 17 and runs through August, with a total of $35,000 in awards available, NASA officials said. 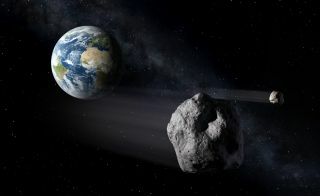 "Protecting the planet from the threat of asteroid impact means first knowing where they are," Jenn Gustetic, NASA Prizes and Challenges Program executive, said in a statement. "By opening up the search for asteroids, we are harnessing the potential of innovators and makers and citizen scientists everywhere to help solve this global challenge." Asteroid Data Hunter asks participants to find new and improved ways to spot space rocks in images captured by ground-based telescopes. Winning solutions must minimize the number of false positives, increase detection sensitivity and run on all computer systems, officials said. The contest series is the first one that contributes to NASA's Asteroid Grand Challenge, a sweeping effort announced last year that focuses on finding all potentially dangerous space rocks and figuring out how to prevent them from harming people here on Earth. “Current asteroid detection initiatives are only tracking one percent of the estimated objects that orbit the sun," Planetary Resources president and chief engineer Chris Lewicki said in a statement. "We are excited to partner with NASA in this contest to help increase the quantity and knowledge about asteroids that are potential threats, human destinations or resource rich."